Last time I repined that there aren't enough "organic" reviews out there, so today I'll give it a go myself. When you eat food, you are able to identify it via its smell, texture in your moth, and how it activates taste cells on your tongue. The classic "taste modalities" are sweet, sour, salty, bitter, and umami. For sweet, sour, salty, and umami, there is a single taste receptor; the only information you get from those senses is degree of activation. In contrast, there are over twenty five bitter receptors, called T2Rs. So is bitter taste similar to the other modalities, a single labeled line, or is it more complex? Some people (the Zuker lab chief among them) propose that, like sweet and sour, we can only detect the extent to which something is bitter. That is, there is a single "labeled line" for all bitter tastes. This would reduce our sense of taste to five labeled lines. The ability to discriminate between similar tastes - e.g. between two citrus fruits - would be due to extra information from olfaction. There is the alternative possibility that bitter is not a single labeled line, but more than one line. Individual bitter taste cells could express a subset of T2Rs, have individualized receptive fields, and discriminate between different bitter compounds. Today I'm going to review the evidence for both theories at the level of the tongue, brain, and behaviour. The bitter receptors were discovered circa 2000, and reported in a series of papers. In one of those papers (Adler, et al 2000), the authors performed in situ hybridization against multiple T2Rs on the tongue. The found similar numbers of cells were labeled whether they used probes for 1, 2, 5, or 10 T2Rs (see below, left). Notably, they state that labeling 2+ receptors labeled 20% of taste cells, while labeling with only 1 receptor labeled 15% of taste cells. Here, the difference could be due to simple labeling inefficiency. They alternately verified this by performing double-labeled fluorescent in situs, and found "most" cells coexpressed multiple receptors. From this, they concluded that individual bitter taste cells in the tongue express most T2Rs, and are sensors for bitter, generally. Individual taste cells express multiple bitter taste receptors. c. In situ label using 10 probes for T2Rs. The number of cells labeled here is similar to single label probes. d. Fluorescence in situ double-labeling for T2R3 (green) and T2R7 (red). Most cells express both T2Rs. From Adler et al 2000. The next year, the Roper lab reported potentially contradictory results. Caicedo and Roper performed confocal calcium imaging on isolated tongues from rats while applying five bitter tastants. Of the taste cells they imaged, 18% (69/374) responded to one of the bitters, but most cells responded to only one or two of the tastants (see below). Individual taste cells respond to only a subset of bitter tastants. A. Three example taste cells each respond to different tastants (denatonium, quinine, cycloheximide, phenylthiocarbimide, and sucrose octaacetate). B. Response for all responsive cells to bitters. Cell ID on left, tastants on top. From top to bottom, cells respond to more tastants. From Caicedo and Roper, 2001. It is hard to reconcile these two results. I am not an expert on in situs, but it is possible that the labeling specificity is not 100% specific (as is often the case for antibody staining). Yet, I think you have to trust that the researchers were competent. I would only emphasize that "most" receptors is not "all" receptors, and so these results are not completely mutually exclusive. In 2005, Zuker fired back. Bitter signaling uses a G-protein coupled cascade that signals through PLCβ2; PLCβ2 KO mice lose all bitter taste. 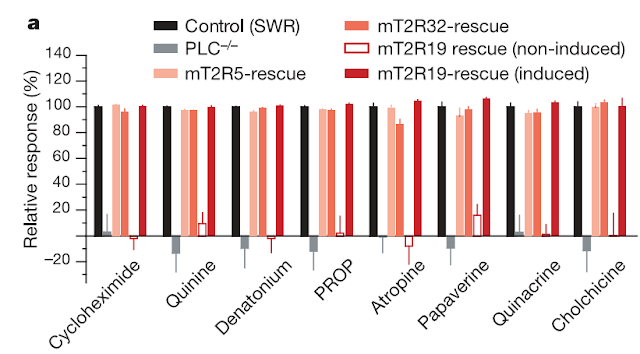 Mueller et al took PLCβ2 -/- mice, and then expressed PLCβ2 under a T2R promoter, like mT2R5 (m for mouse). When they did that they were able to fully rescue bitter taste. Expression of PLCβ2 under the expression of a single bitter receptor rescues all bitter taste. The "relative response" measures the amount of licking mice did of bitter compounds (inverse). Control mice do not lick bitters. PLC -/- mice cannot taste bitter, and so lick bitters. PLC expressed behind the promoters for mT2R5, mT2R32, and mT2R19 is able to rescue bitter perception. From Mueller et al 2005. However, again, I feel this is not quite conclusive. If bitter taste receptor expression overlaps randomly, while an individual taste cell may not express all T2Rs, the whole population of mT2R5 taste cells could express all the other T2Rs. And hence allow full recovery of bitter sensitivity. There's a lot more interesting stuff about bitter taste on the tongue - for example, the Meyerhof lab has identified the ligands for many human taste receptors - but let's move to the brainstem (and beyond!). 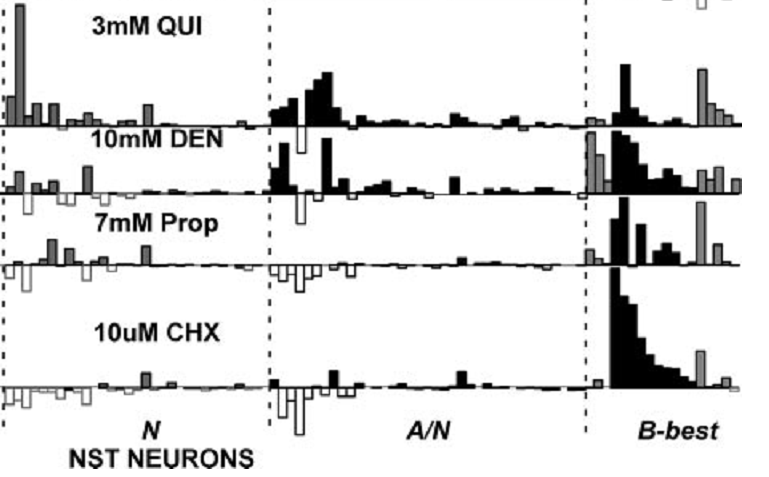 Individual NST neurons can discriminate denatonium (DEN) from cycloheximide (CHX). Pardon the figure, it's excised from a MUCH larger one. y-axis is response rate, x-axis is neuron ID. On the right are the bitter sensitive neurons (B-best). The first three neurons respond to denatonium, while the rest do not. There also may be quinine neurons. From Geran and Travers, 2006. As far as I know, no one has presented animals with multiple bitters while electrically recording from gustatory cortex. 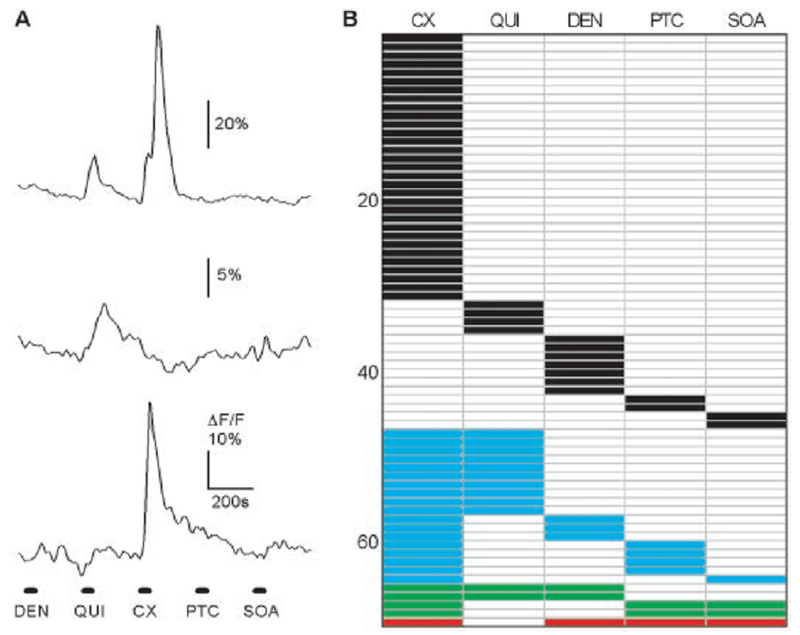 However, two weeks ago I covered a recent paper on Ca2+ imaging in gustatory cortex. While the main focus of the paper was taste hotspots in gustatory cortex, they also presented the following figure in the supplementary data. They applied multiple bitters while imaging cortex, and found that not all cells responded to all the bitters presented. In general, there was some unreliability in there results, - many "responsive" cells only responded in a subset of trials - but this does raise the possibility that cortical cells can discriminate between different bitters. Gustatory cortical neurons may be able to discriminate between different bitters. left. Map of responsive cells to three bitter: denatonium, cycloheximide, and quinine. middle. Overlaid map of cells to left, color coded for cells that respond to all 3 bitters (red), 2 bitters (yellow), and 1 bitter (white). right. Bar chart of # of cells that respond to bitters. So what about, you know, bitter perception itself? This has been rather ill studied. Many people have shown that typical "bitter" stimulants are aversive. Only a couple have tested whether mice can discriminate between them. The best paper I've found tested whether mice could discriminate between quinine and denatonium (I wonder if scientists choose these chemicals so often because they're much easier to pronounce and remember than sucrose octaacetate). To ensure that the mice were not discriminating between different intensities of bitterness, they measured the aversiveness of each chemical, and used iso-yucky concentrations. Thirsty mice were allowed to lick a water bottle for five seconds. The lick rate over the last 3 seconds of the trial determined the "stimulus licks" and were normalized to water licks. Dashed rectangles denote equivalently aversive concentrations. From Spector and Kopka, 2002. Once they had determined the equivalent concentrations to use, they employed a two-alternative forced choice task to measure discrimination. They first validated their system by testing whether animals could discriminate between quinine and KCl (below, left). Then they switched quinine for denatonium to see if the mice noticed, and found that the mice continued to discriminate between denatonium and KCl, as if quinine and denatonium were the same. As a positive control, they swapped NaCl for denatonium, and found that the mice needed a few testing sessions to relearn the new task (middle). 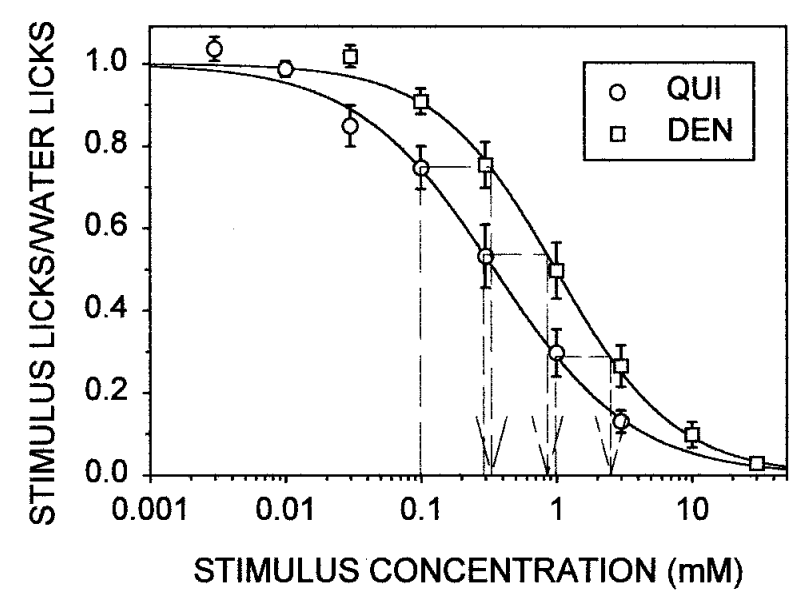 Finally, they tested whether mice could discriminate quinine and denatonium, and found that discrimination was at chance level (right). 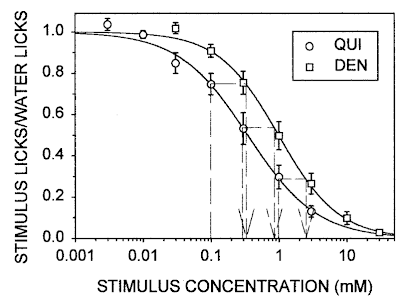 Mice are unable to discriminate between quinine and denatonium. See above for details. Similar experiments were performed in flies, using the proboscis extension reflex as a measure of palatability (Masek and Scott, 2010). I'm sure someone has tested this in humans, but I have not read the study yet. My main issue with these experiments is that they are using such high, aversive concentrations of the bitter stimuli that they may be beyond a discriminatory range. For example, bitter taste may have two functions: discrimination, and aversion. At low concentrations, certain chemicals may be useful for discrimination, and non-toxic; at high concentrations, however, they signal toxicitiy. It would be interesting to see how discrimination worked at lower concentrations. After all this data, what can you conclude? The evidence for a single bitter labeled line come from the taste input and output, the receptors and the behaviour. In the brain, however, it seems that individual cells can discriminate between bitter tastants. It's certainly possible that taste neurons can discriminate between bitters before discarding the information as useless. I think the main issue here is the old scientific problem of, "just because you can't detect it doesn't mean it's not there." I know reading these papers has suggested a few experiments to my mind. Adler, E., Hoon, M a, Mueller, K. L., Chandrashekar, J., Ryba, N. J. P., & Zuker, C. S. (2000). A novel family of mammalian taste receptors. Cell, 100(6), 693-702. Geran, L. C., & Travers, S. P. (2006). Single neurons in the nucleus of the solitary tract respond selectively to bitter taste stimuli. Journal of neurophysiology, 96(5), 2513. Am Physiological Soc. doi:10.1152/jn.00607.2006. Mueller, K. L., Hoon, Mark a, Erlenbach, I., Chandrashekar, J., Zuker, C. S., & Ryba, N. J. P. (2005). The receptors and coding logic for bitter taste. Nature, 434(March), 225-230. doi:10.1038/nature03366.1. Spector, A. C., & Kopka, S. L. (2002). Rats fail to discriminate quinine from denatonium: implications for the neural coding of bitter-tasting compounds. The Journal of neuroscience : the official journal of the Society for Neuroscience, 22(5), 1937-41.